We believe that your cake is the centrepiece of your event, and you want it to taste as stunning as it looks! The most delicious cakes are freshly baked using quality, simple ingredients to create a dessert that is scrumptious inside and out. 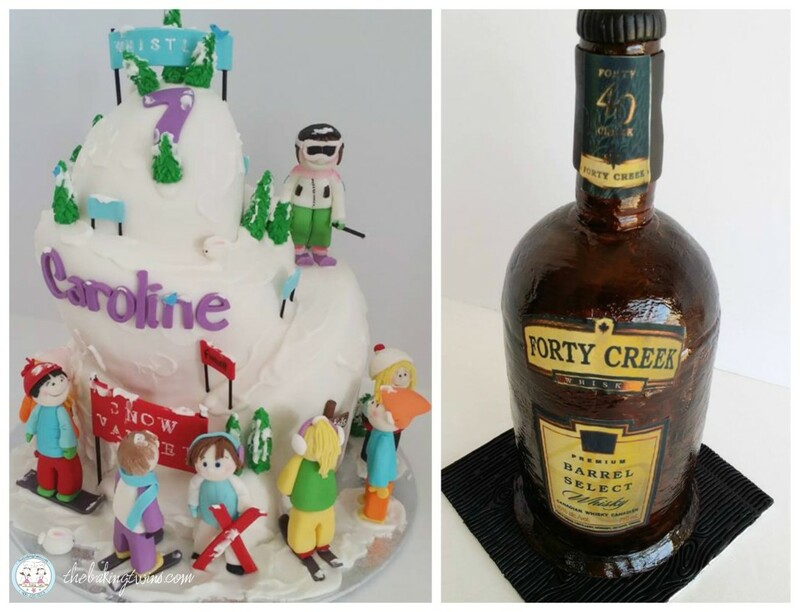 Choosing a cake flavour can sometimes be a daunting task – especially when you’re planning a larger event and trying to please a variety of people. There are endless possibilities when choosing your cake flavours, fillings and icings and you want to choose something that not only pleases you and your guests, but matches the time of year and the theme of your event. We have put together a flavour guide to help you choose your perfect cake flavour, whether you prefer classic, simple flavours to want to try something a little different! Spring is a time for new beginnings, marking the start of a fresh new season and a fresh new chapter- making it the perfect time to tie the knot. That, and the fresh, tangy flavours that pair great with the budding flowers and warm breeze. Our favourite spring flavours are anything citrus! 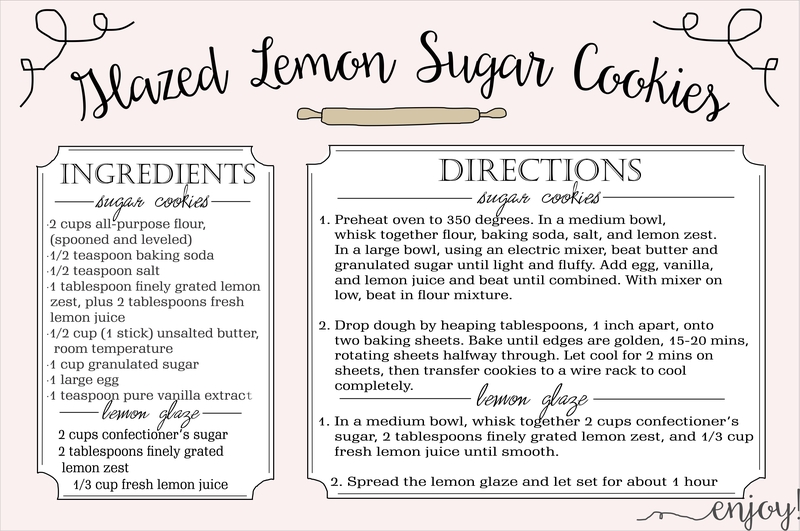 Lemon offers a light citrus flavour that is a great choice for couples who don’t want a very rich or heavy cake. 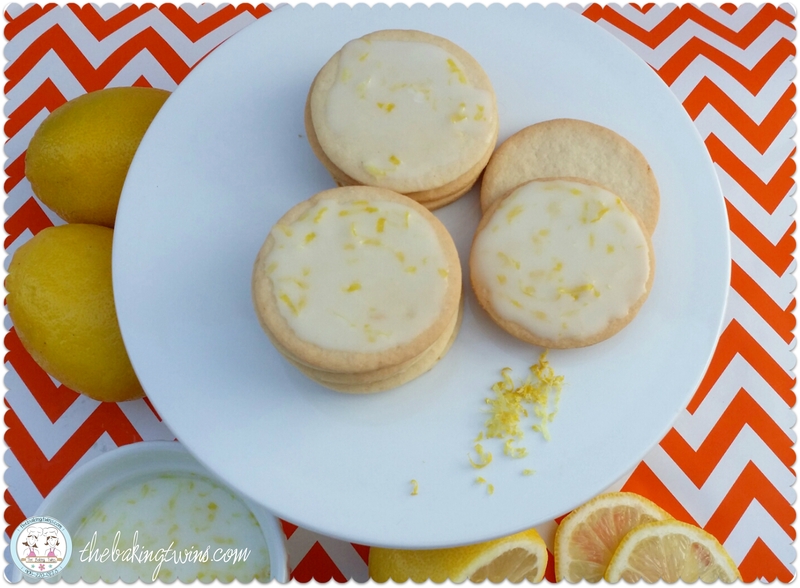 It’s a great tangy crowd pleaser that is the perfect sweet finish to any event! A lemon cake pairs perfectly with a raspberry or strawberry filling for a fruity blend. Another great option is to pair the lemon cake with a simple lemon buttercream icing to highlight the lemon flavour. Although we are a huge fan of these fresh and light Spring flavours, a classic chocolate cake remains one of our favourite and most popular flavours for events all year around. With so many different levels of richness and flavour pairings, chocolate cake can be completely customized to the season and personal taste. You can’t ever go wrong with chocolate cake! 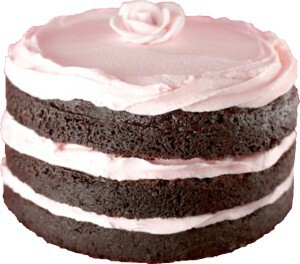 A simple chocolate cake can be paired with a buttercream frosting for a classic crowd pleaser. This childhood favourite can be elevated to a more sophisticated level when paired with flavour accents such as mint, orange and strawberry fillings. With Fall right around the bend and delicious Autumn flavours coming along with it, carrot cake is the perfect addition to any rustic Fall event. Carrot cake is a slightly untraditional and unexpected route, making for a unique addition to your sweet table and dessert round. With chopped pineapple and grated carrot as the main components, it is perfectly paired with a smooth cream cheese frosting. It reminds us of all the best things about fall- sitting be the fire, sipping a hot cup of coffee and the crisp smell of Fall air. great way to spice up your event with something different from your classic chocolate or vanilla. While carrot cake adds an unexpected sweet twist to spice up your dessert table, many couples choose a traditional vanilla cake so they can experiment with different and fun icings and fillings. You cannot go wrong with a classic vanilla cake paired with vanilla frosting, especially when you’re planning a larger event and would like to please a variety of preferences. However, if you’d like to get a bit more adventurous with flavours, a vanilla cake serves as a great base. It can be dressed up with essentially any frosting, filling or fruit! Using a vanilla cake is a great compromise when trying out a different flavour. The best way to choose your ideal flavour combination and achieve a taste you know you and your guests will love is to book a cake tasting. At a cake tasting, you will receive several icing and cake flavours to try, so you can experiment with as many combinations you desire! 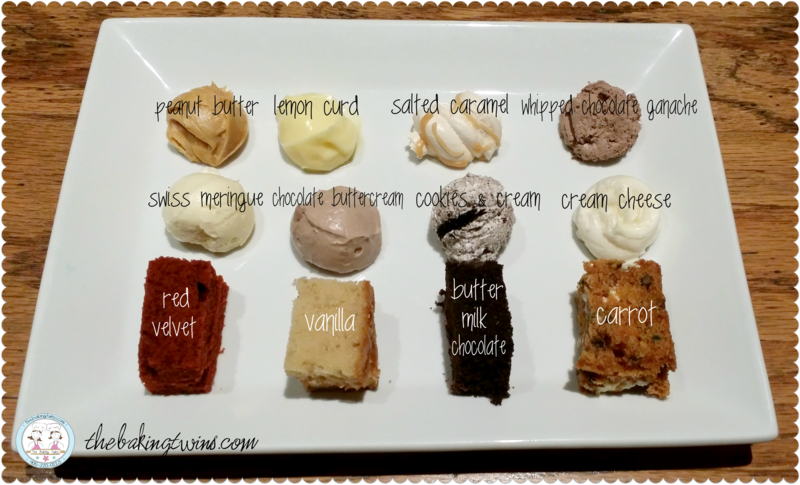 We like to believe that a cake tasting is a sweet break from the stress of planning a wedding or event. Who doesn’t love to sit back, relax, and eat cake? If you’re contemplating flavour options and combinations and worrying about pleasing a large group of people, you don’t have to choose just one flavour. 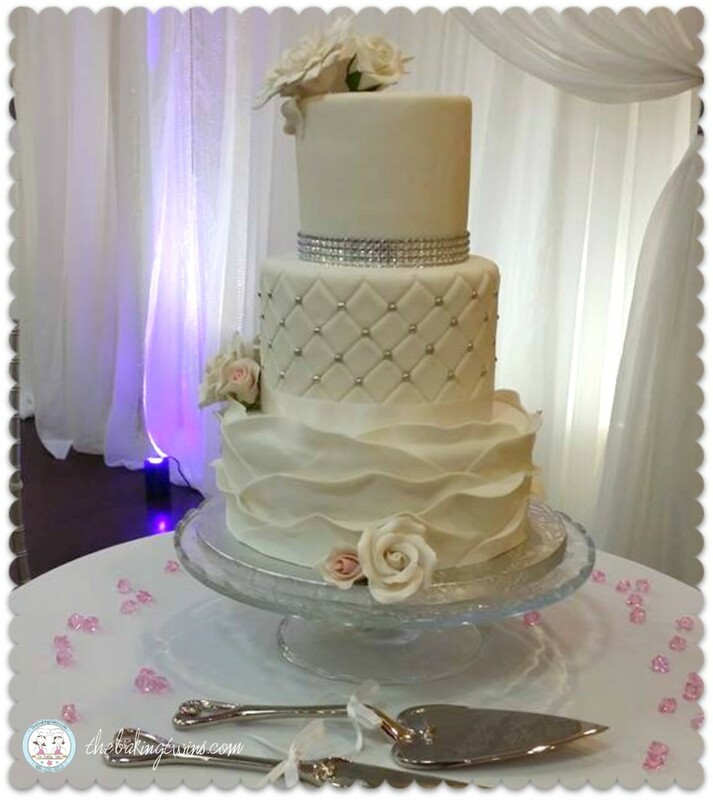 Each tier of your wedding cake can have a different flavour to give your guests a variety of sweet options and please everyone at your event. The biggest problem will be choosing just one flavour to indulge in! These are only a few flavours from our scrumptious flavour menu – you can view the rest here! Although, we must warn you – you may have a serious sweet tooth after reading! Edible treats and favours are always a hit with party guests, whether offered at a bridal shower, a lunch or dinner with bridesmaids, the rehearsal dinner or wedding reception, you can bet that the recipients will appreciate having a little something to indulge their sweet tooth with later on. August is all about weddings, and giving something sweet to the people that will surround you on your big day. Instead of sending guests home with trinkets that likely sit around collecting dust, give them a treat they won’t be able to resist digging into. We’ve put together our favourite edible favours that are adorable and affordable! 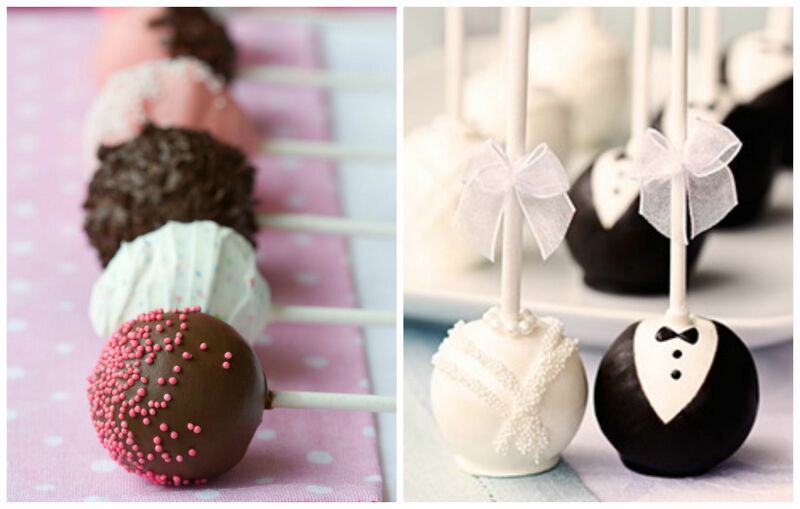 Cake Pops are a fun, creative and tasty treat to wow your guests at any wedding or bridal shower. Bite-size cake balls are available in several temping flavors —carrot cake, lemon, red velvet, buttermilk chocolate, brownie and vanilla sponge —plus seasonal picks, like pumpkin or spice cake. Cake pops are a great option for dessert tables or as part of a gift box. The great thing about cake pops is that they can be customized to your event, from custom flavours to custom designs. One of our favourite designs is this Mr. and Mrs. cake pop duo- the perfect pair! The beautiful bride is dressed with white chocolate and glittery sanding sugar, while the groom is cloaked in a dark and white chocolate tuxedo for a classic look. Coated in white and dark chocolate decorated with pink to add a nice “pop” is another classic design that we cannot get enough of. With cookies, there is no limit. Cookies are so customizable, and can be designed to suit any wedding theme and favourite flavours. These personalized favours are where you can get creative and let your personality come through. These custom-designed, hand-decorated cookies shaped as wedding gowns, wedding cakes or rings are a great way to thank your guests and celebrate the special occasion with something extra sweet. We love the idea of having these cookies laid out on a sweet table, or handed out as favours at a bridal shower!. 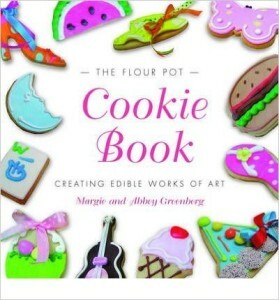 We love how creative you can get with cookies, from simple designs to custom shapes and colours. One of our favourites has to be this stacked cookie cake, a perfect favour for your bridal party. These favours are perfect to tie in your theme in a sweet way for your guests to enjoy on the way home! up! With flavors like cookies and cream and salted caramel, your guests will love taking home this extra treat at the end of the party. Plus, they are super easy to customize with your colours by adding a ribbon or sticker with your monogram. These mason jar cupcakes-to-go are layered with chocolate cake and chocolate icing, a classic combination that is sure to pleasure all of your guests. 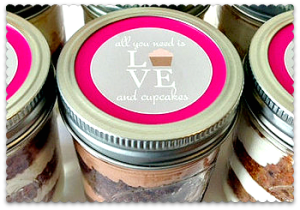 The cupcake is sealed off with a personalized label that can match your wedding invitation and wedding colours. We love this simple design! 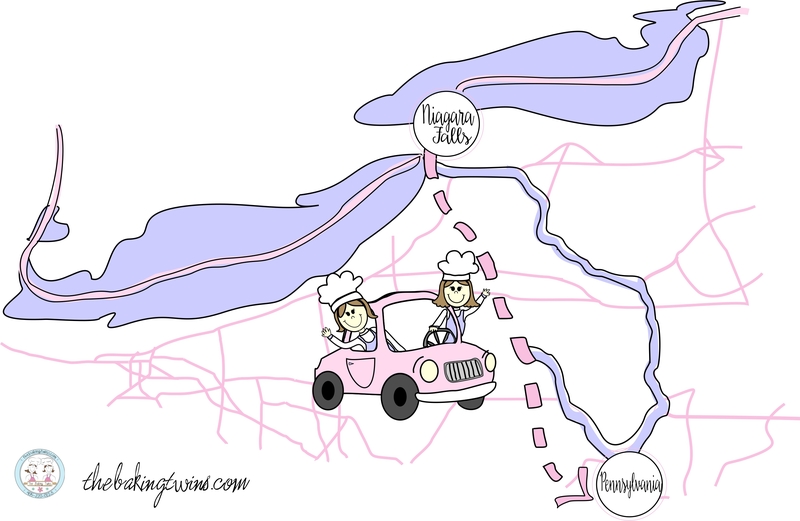 These are perfect bridal shower gifts and wedding favours, so that your guests have something sweet to eat on the way home or after the big event! Not only are fortune cookies a light and sweet favour, but they are a great way to add some personality to the wedding and add a message that thanks each of your guests. This is a fun and unique favour for weddings and bridal showers! Each fortune cookie is wrapped with a personalized “fortune,” which can include your names, wedding date, a themed graphic or a meaningful quote. Who doesn’t love an extra treat for the car ride home? These whoopie pies are a fun takeaway favor and with offerings such as raspberry, pumpkin, red velvet or chocolate. 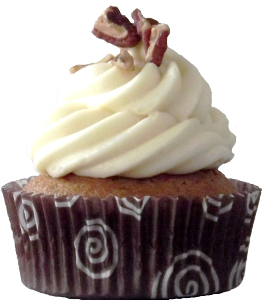 There is sure to be a scrumptious flavor that you and your guests will enjoy! 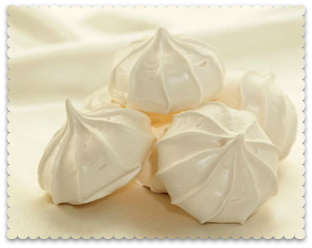 Meringue kisses, meringue drops, or simply meringues. Whatever you want to call them, these sweet little cookies are equal parts chewy and crunchy, and everyone loves them. Impossibly delicious and so pretty – easily tinted to suit any colour scheme. Not only do these little treats taste great, but they are a cute and simple favour that can make any tablescape look a little sweeter! The delicate, whimsical design is perfect for weddings and bridal shower events. You can never go wrong with baked goods, and the options are endless! The Baking Twins allow you to create unique favours from custom fortune cookies or cupcakes to personalized cookies.